Arginine alpha-ketoglutarate (AAKG) is a dietary supplement used by athletes and bodybuilders to improve sports performance, reduce muscle fatigue, and enhance recovery. However, AAKG supplementation may also have added benefits for various diseases. Read on to find out more about how AAKG works, and 12 ways it can help improve your health. Arginine alpha-ketoglutarate (AAKG) is a modified version of the amino acid arginine [R]. Alpha-ketoglutarate is an intermediate compound in the series of reactions that produce energy for the body. It is the source of the amino acids glutamate and glutamine. Glutamate is the main excitatory neurotransmitter in the brain and can increase bone formation. Glutamine is the main source of energy for cell division [R, R]. To improve absorption in the stomach, alpha-ketoglutarate supplements come in the form of various salts. The most common combination is ornithine and alpha-ketoglutarate [R, R]. Alpha-ketoglutarate also regulates amino acid synthesis, energy production, and formation of free radicals. It functions as a messenger molecule in many chemical reactions in the body [R]. Glutamine enhances protein, muscle development, and immune function [R]. Arginine, also known as L-arginine, apart from being a component of proteins, stimulates the release of hormones such as insulin, glucagon, prolactin, and growth hormone. Arginine also plays a critical role in maintaining normal blood pressure, heart function, and immunity. These functions are mediated through the production of nitric oxide. 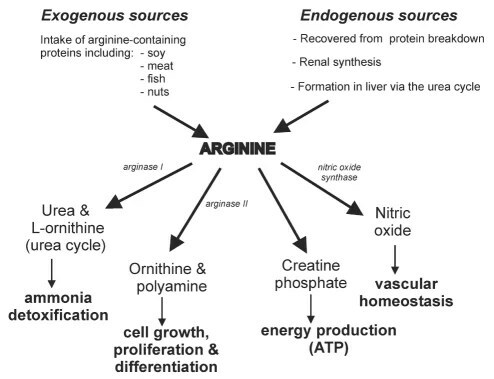 Arginine is broken down into ornithine and creatine. Ornithine is essential for cell growth and division, while creatine is important for muscle contraction [R]. Arginine is obtained from food and synthesized in the body. It is therefore referred to as a semi-essential amino acid. In healthy adults, food and synthesis in the body are sufficient to meet the necessary demands for this amino acid. These demands include tissue repair, synthesis of proteins, and maintenance of immune function [R]. During periods of rapid growth, physical stress, or injury, the supply of L-arginine may be insufficient to meet the body’s needs. During this time, L-arginine taken as a dietary supplement can help maintain muscle mass and improve bodily function [R]. Supplementing L-arginine can improve the capacity for exercise. This improvement can be seen immediately after consuming arginine. Additionally, long-term improvements are seen due to increased protein synthesis in muscles [R]. In addition to its performance-enhancing effects, arginine has proven to be a safe and effective therapy for high blood pressure, type 2 diabetes, and erectile dysfunction [R, R, R, R]. Arginine reduces infection rates in conditions where the body is prone to infection, such as surgery or critical illness [R]. Arginine in combination with alpha-ketoglutarate (as arginine alpha-ketoglutarate [AAKG]) has been mainly manufactured and marketed to athletes for its performance-enhancing potential [R, R, R]. However, in clinical settings, L-arginine alone is used more often [R, R]. Arginine alpha-ketoglutarate is formed when two arginine molecules combine with one molecule of alpha-ketoglutarate. The combination of alpha-ketoglutarate and arginine improves the stability of arginine. This is supposed to improve its performance-enhancing abilities and its role in energy production. L-arginine is one of 20 amino acids. It is considered a semi-essential amino acid because it can be obtained from both foods and built within our bodies. L-arginine is found in high concentration in foods like watermelon, nuts, seeds, algae, meats, seafood, beans, lentils, whole grains, rice protein concentrate, and soy protein isolate [R]. L-arginine is synthesized in the body from citrulline. Though this synthesis can occur in many cell types, the majority occurs in the kidney [R, R]. Alpha-ketoglutarate in an intermediate in the cycle to convert food to energy. In this cycle, it is formed from isocitrate. It can also be formed from glutamate [R]. Dietary supplements of L-arginine alpha-ketoglutarate (AAKG) are sold in the form of tablets, pills, or powder. Alpha-ketoglutarate and L-arginine can also be purchased separately as individual supplements. These are available as capsules or powder. It is unknown how the combination of arginine alpha-ketoglutarate enhances performance but is most likely caused by elevated levels of nitric oxide [R]. Alpha-ketoglutarate is a product of the mitochondria and plays a vital role in the conversion of food into energy. It is also a source of glutamine and glutamate. In muscles, glutamine and glutamate inhibit protein breakdown and increase protein synthesis [R]. Alpha-ketoglutarate enhances bone formation. It regulates the synthesis of collagen possibly by increasing the number of molecules available for synthesis. Collagen is a significant component of bone tissue. Alpha-ketoglutarate stimulates the production of insulin-like growth factor-1 and growth hormone. These are both hormones that regulate bone recycling and formation of new bone tissue [R]. Alpha-ketoglutarate also has immune-enhancing properties and is potentially useful in delaying aging [R]. L-arginine is broken down into nitric oxide (NO) in various tissues. Depending on where it’s produced, nitric oxide plays a critical role in regulating diverse functions in the body [R, R]. In the cardiovascular system, it has protective effects by relaxing blood vessels. This increases blood supply and oxygen delivery around the body, and aids in the removal of waste. L-arginine also stimulates the secretion of growth hormone. This results in the production of insulin-like growth factor 1 (IGF-1). IGF-1 enhances protein synthesis and thus increases muscle development [R]. L-arginine is also involved in the removal of toxins by forming urea, which is filtered out of the body through urine [R]. In the liver, L-arginine is converted to glucose and alpha-ketoglutarate. Therefore, it acts as a potential source of energy [R]. AAKG combines the potential benefits of both molecules, L-arginine, and alpha-ketoglutarate. There is limited research regarding the combination of arginine and alpha-ketoglutarate Most of the reported benefits of this combination are anecdotal. The effects of supplementing with arginine alpha-ketoglutarate for 7 days were studied in 24 physically active men after performing resistance (DB-RCT). Arginine alpha-ketoglutarate combined had no effects on heart rate, blood pressure, blood flow, or nitric oxide levels. However, the amount of L-arginine in the blood was increased [R]. Supplementing arginine alpha-ketoglutarate (300 mg) in 16 healthy men did not provide any performance-enhancing benefit, regardless of their exercise training status (DB-RCT) [R]. In a randomized controlled trial in 12 trained men, AAKG did not improve muscle endurance or significantly affect the blood pressure response to anaerobic work [R]. In a randomized controlled trial in 35 resistance trained men, arginine was safe and well tolerated and positively influenced muscular strength and peak power performance. AAKG did not influence body composition or aerobic capacity [R]. Although there is limited evidence that the combination of arginine alpha-ketoglutarate has health benefits, the individual molecules L-arginine and alpha-ketoglutarate have been researched for their health benefits. Supplementing alpha-ketoglutarate may be useful in treating severe trauma, infections, surgery, and wound healing [R]. Supplementation of ornithine alpha-ketoglutarate in 54 burn patients significantly improved wound healing (DB-RCT) [R]. Similarly, a study of 60 burn patients who were given ornithine alpha-ketoglutarate for 21 days showed significant improvements in wound healing (DB-RCT) [R]. In rats suffering from burns, ornithine alpha-ketoglutarate supplementation increased glutamine levels, resulting in improved wound healing [R, R]. In 21 people who underwent surgical trauma, supplementing alpha-ketoglutarate in a controlled trial prevented muscle breakdown and increased protein synthesis [R]. Abdominal surgery reduces muscle protein synthesis and increases fatigue. In 22 adults who had stomach surgery (RCT), supplementing alpha-ketoglutarate improved glutamine supply in the muscles and prevented muscle loss [R]. Alpha-ketoglutarate increases collagen production and iron absorption, which increases bone density and strength [R]. In 76 menopausal women (DB-RCT) with bone weakness, intake of alpha-ketoglutarate for 24 weeks prevented bone loss and reduced the symptoms of menopause. It also reconstructed the bone tissue [R]. A number of animal studies have indicated that supplementing alpha-ketoglutarate improved bone density [R, R, R]. Alpha-ketoglutarate may improve immune function. In the body, it is converted into glutamine. Glutamine can increase levels of white blood cells (macrophages and neutrophils) [R]. Supplementing ornithine alpha-ketoglutarate in old patients that are nutrient deficient successfully improved overall health. This was seen by increasing appetite and improving motor skills. It also shortened recovery time from severe illnesses and surgery [R]. In mice, alpha-ketoglutarate added to drinking water improved immunity in the stomach and lowered body weight [R]. In cell-based studies, alpha-ketoglutarate prevented the multiplication of cancerous cells [R, R]. In multiple animal studies, supplementing alpha-ketoglutarate reduced blood supply to tumors, resulting in tumor death [R]. Supplementation with alpha-ketoglutarate delayed aging in the worm Caenorhabditis elegans [R]. In rats, oral supplementation of alpha-ketoglutarate blocked the effects of cyanide, a toxic poison that can be fatal [R]. L-arginine has been proven to benefit a variety of conditions such as diabetes, high blood pressure, and erectile dysfunction [R, R, R, R]. A daily intake of L-arginine for 45 days reduced muscle fatigue and increased athletic performance in 56 male soccer players (DB-RCT) [R]. In 8 healthy subjects, L-arginine supplementation before exercise improved strength and exercise capacity by reducing blood levels of lactate and ammonia. Both are breakdown products associated with muscle fatigue (DB-RCT) [R]. Long-term (3-week) L-arginine supplementation in 16 healthy males reduced blood lactate levels and oxygen consumption during exercise (DB-RCT) [R]. L-arginine supplementation for 6 months in 11 postmenopausal women also improved muscle force and power (DB-RCT) [R]. Diabetes is associated with low levels of arginine and blood vessel dysfunction. Several animal studies indicate that supplementation with L-arginine may be an effective way to improve blood vessel function in diabetes [R]. Acute injection of L-arginine increases the levels of insulin in the blood. This reduces the amount of glucose released from the liver [R]. Long-term (21- to 31-day) oral intake of L-arginine in 26 patients improved insulin sensitivity, blood vessel function, and reduced blood glucose levels in patients with type 2 diabetes (DB-RCT) [R, R]. In a controlled trial of patients with advanced breast cancer, L-arginine intake for 3 days (before chemotherapy) reduced the suppression of the immune system caused by chemotherapy [R]. Oral intake of L-arginine in 13 healthy individuals increased the levels and activity of immune cells involved in combating tumor growth (C56+, natural killer cells, lymphocyte-activated killer cells) [R]. In human cells and mice, L-arginine supplementation increased survival and anti-tumor activity of immune cells [R]. L-arginine supplementation improved the capacity for exercise in 16 elderly individuals with heart disease (DB-RCT) [R]. In 22 individuals with stable angina pectoris and healed heart attack, oral L-arginine taken for 3 days improved exercise workload by increasing oxygen availability during physical activity (DB-RCT) [R]. In 36 healthy humans, arginine supplementation for 2 weeks enhanced wound healing and improved immune responses (DB-RCT) [R]. In guinea pigs, L-arginine ingestion improved immunity and survival from burn injuries [R]. In mice models, L-arginine reduced injury to the airway passage caused due to allergic inflammation [R]. A meta-analysis showed that L-arginine can reduce blood pressure in adults with high blood pressure [R]. Arginine supplementation reduced the increased reactivity of blood cells involved in clotting (platelets) in adults with high cholesterol levels. It also reduced blood clotting (DB-RCT) [R]. In rabbits, supplementing with arginine benefits atherosclerotic conditions by widening blood vessels, thinning vessel walls, and inhibiting the buildup of fat [R, R, R]. Arginine supplementation in 28 healthy men for 45 days reduced blood sugar and fat levels (DB-RCT) [R]. However, a meta-analysis of 927 showed no effect of arginine supplementation (9 g/day for 30 days to 3 months) in patients with acute heart attacks [R]. Also, arginine did not improve nitric oxide availability in patients with heart disease [R]. Long-term use of L-arginine in addition to diet and exercise improved glucose and insulin levels. It also decreased belly fat in overweight adults with type 2 diabetes [R]. In pigs, dietary supplementation with L-arginine reduced fat deposits and promoted muscle gain throughout the body [R]. Oral L-arginine supplementation considerably reduces the frequency and intensity of chest pain attacks and the use of painkillers in 8 patients with movement disorders of the gut (DB-RCT) [R]. In rats, L-arginine accelerated ulcer healing by increasing blood flow and forming new blood vessels [R]. L-arginine given for 6 weeks to 29 men improved erectile dysfunction in 31% of them (DB-RCT) [R]. Supplementation with oral L-arginine in 34 women unresponsive to in vitro fertilization (IVF) increased pregnancy rates. This effect occurred by improving ovarian response and the environment of the uterus [R]. In goat sperm cells, L-arginine increased sperm vitality through increased production of nitric oxide. This effect may be beneficial for increasing fertility [R]. L-arginine (1.6 g/day) intake increased intellectual function in elderly patients with dementia [R]. Aging is associated with reduced nitric oxide levels. Arginine supplementation may help to maintain normal nitric oxide levels to counterbalance the aging process [R]. Supplementing arginine alpha-ketoglutarate (AAKG) for 8 weeks had no significant adverse effects in 45 healthy men (DB-RCT) [R]. There have been 3 reported hospitalizations associated with arginine alpha-ketoglutarate supplementations. Patients presented with dizziness, vomiting, palpitations, and syncope [R]. No significant side effects caused by alpha-ketoglutarate have been reported in humans [R]. However, there is potential for toxicity with repeated intake based on studies in rats. Adverse effects observed were diarrhea and a decrease in body weight. Anemia was also seen in female rats, but this was resolved after stopping supplementation [R]. Arginine has not been associated with serious adverse effects [R]. Doses up to 30 grams per day are usually well tolerated. The most frequent adverse effects are nausea and diarrhea reported occasionally at doses between 15 to 30 grams [R]. No effect on liver function, blood glucose, or concentration of blood electrolytes has been reported [R]. A meta-analysis of 11 studies (DB-RCT) including 387 healthy participants indicates that it can significantly lower blood pressure [R]. At higher doses, arginine has been reported to give a bitter taste in the mouth. Arginine alpha-ketoglutarate supplement should not be used by individuals who have had a heart attack [R]. Not enough is known about the use of AAKG or alpha-ketoglutarate during pregnancy and breastfeeding. Therefore, use in these conditions is not recommended. Arginine supplementation should be used with caution in infants, pregnant or lactating women, and in individuals with viral infections or serious kidney or liver malfunction, asthma, or cancer [R, R]. Patients with herpes infections should take L-arginine with caution, as it may aggravate the virus and increase symptoms. However, this caution has not been validated in clinical trials [R]. Patients with electrolyte imbalances are at a higher risk of developing metabolic acidosis, a condition in which the amount of acid in the blood increases to dangerous levels. This occurs with injectable forms of arginine (due to the high chloride content found in these preparations) [R]. Similarly, in patients with kidney and/or liver impairment, low potassium and high blood urea nitrogen levels may occur with L-arginine supplements [R]. Research-based evidence to support the use of arginine alpha-ketoglutarate to increase strength and improve exercise performance is limited and not conclusive. More studies are needed to demonstrate the beneficial effects of arginine alpha-ketoglutarate supplementation in various disease conditions [R, R]. Although L-arginine and alpha-ketoglutarate have demonstrated health benefits when studied individually, there is no research indicating that taking them together will enhance these benefits. Drug interactions with arginine alpha-ketoglutarate are not known. No drug or food interactions have been reported with alpha-ketoglutarate. L-arginine may interact with insulin and cholesterol-lowering agents. L-arginine is broken down into nitric oxide in the body, and thus patients taking nitric oxide donors should supplement with caution. These include isosorbide mononitrate, sodium nitroprusside, and glyceryl trinitrate. The suggested dosage of arginine alpha-ketoglutarate ranges from 1.2 to 3.5 grams per tablet, taken 2 or 3 times a day on an empty stomach. The tablets should be taken preferably in the morning and at least 30 minutes before workouts. Up to 20 grams of L-arginine per day is considered safe and non-toxic [R]. The user recommended dose of the powdered form ranges from 1.5 to 3.5 grams per day. People doing weight training reported relief from muscle pain when taking arginine alpha-ketoglutarate. Many found that intake made them feel mentally and physically active. People also found that it increased their muscle strength and energy output. L-arginine supplements seemed great for people with sensitive stomachs and they experienced no side-effects. People recommended it for a great pump at affordable pricing. Due to the mild taste associated with it, people recommend it be consumed with a juice or smoothie. I was using 6 grams a day and my PSA was 4.5, Didn’t stop taking it but I added Nettle root and my PSA now is 1.00 , I’m still taking arginine. The increase in viruses etc. is not worth the benefits in my estimation, as so many have pathogens that it can increase…which is why, after researching, and seeing the benefits, I did not take it. Please make this more prominent in the article…crucial for so many. Is there utility to supplementing straight l-arginine instead of just focusing on supplementing it’s substrate l-citruline? Is it better to take l-citruline over l-arginine? 2) causes outbreak of Herpes Viruses.